Kazakhstan's interim President Kassym-Jomart Tokayev, center, attends a wreath laying ceremony at the Tomb of the Unknown Soldier by the Kremlin wall in Moscow, Russia, Thursday, April 4, 2019. 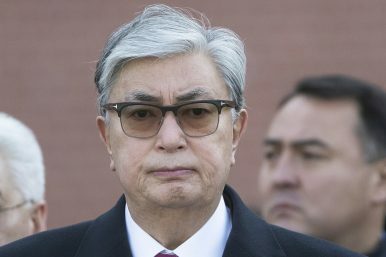 Kazakhstan’s interim president, Kassym-Jomart Tokayev, announced snap elections set for June 9, 2019 in a televised address to the nation on Tuesday afternoon. Sitting in Nur-Sultan, the recently renamed capital of Kazakhstan, Tokayev said that after consulting with Nazarbayev and other government leaders, he had decided to hold presidential elections early. Nazarbayev is the source of the uncertainties roiling Kazakhstan’s political space. On March 19, in a televised address Nazarbauyev announced his resignation and handing off of the presidency, as the constitution has it, to the chair of the Senate, Tokyaev. The next day Tokayev assumed the interim presidency, with the general assumption that he may serve out the rest of Nazarbayev’s term. But as I noted at the time, “The next presidential elections were scheduled to take place by April 2020, but early elections are the norm in Kazakhstan.” Tokayev’s first initiative as interim president was to call for the renaming of Astana to Nur-Sultan (with a hyphen, no one knows why). Meanwhile, the Senate elevated Nazarbayev’s eldest and most politically active daughter to the top of the Senate, putting her in a position of significance and power, and constitutionally second in line for the presidency. Nazarbayev, though stepping down from the presidency, stated in his resignation speech that he wasn’t going anywhere. He remains the head, for life, of the security council; retains the title and more importantly the legal perks, chiefly protection from prosecution, endowed by his status as Leader of the Nation; and is still head of Nur Otan, the only party in Kazakhstan with influence. A firm date for elections is the tiniest of uncertainties settled. Who will run to become the next president of Kazakhstan? Speculation abounds about possible successors but the truth is that we just don’t know. Nursultan and Nur-Sultan have exerted considerable effort over the years toward demolishing anything resembling opposition politics in the country. This culling has left the state with Nur Otan, the president’s party, and a handful of potemkin parties like Ak Zhol, a shadow of its former self, and a neutered version of the Communist Party. To illustrate the shallowness of the political pool in Kazakhstan, it’s worth recounting an anecdote highlighted in Joanna Lillis’ well-timed book Dark Shadows: Inside the Secret World of Kazakhstan. Mels Yelusizov, a registered candidate for the presidency in the 2011 election, was asked after casting his own ballet who had voted for. “Nazarbayev,” he said. Given that Kazakhstan has never held an election considered free and fair by legitimate observers and the only truly developed political party is Nur Otan — which Nazarbayev runs — it would seem logical to assume that the state machine will arrange itself behind whatever candidate Nur Otan, and by that I mean Nazarbayev, chooses. Tokayev, in his statement, promised fair and open elections but the system has been rigged for so long and opposition parties starved of space to develop that it’s difficult to imagine any gathering the resources and getting up to speed with the elections now only two months away. Nur Otan announced shortly after Tokayev’s announcement that it would choose its candidate within 20 days. Tokayev is a favored pick by some, as is Nazarbayeva, though she reportedly said she wasn’t going to run. One has to wonder what the point of this theater has been. Why did Nazarbayev go through the grand production of surprise retiring in March when he could have just called for early elections at that time? It would have not been unusual to do so. Why bother with an interim president at all? Did Tokayev serve his purpose or was he not as well-received as Nazarbayev had hoped, necessitating a change of plan? Was this the plan all along? Does any of this even matter? The only certainty is that Nazarbayev, now from behind a thin curtain of retirement, is still the shot-caller in Kazakhstan. Everything else is a flashy theater production designed to distract the Kazakh people, and the international community, from Kazakhstan’s economic and social problems.